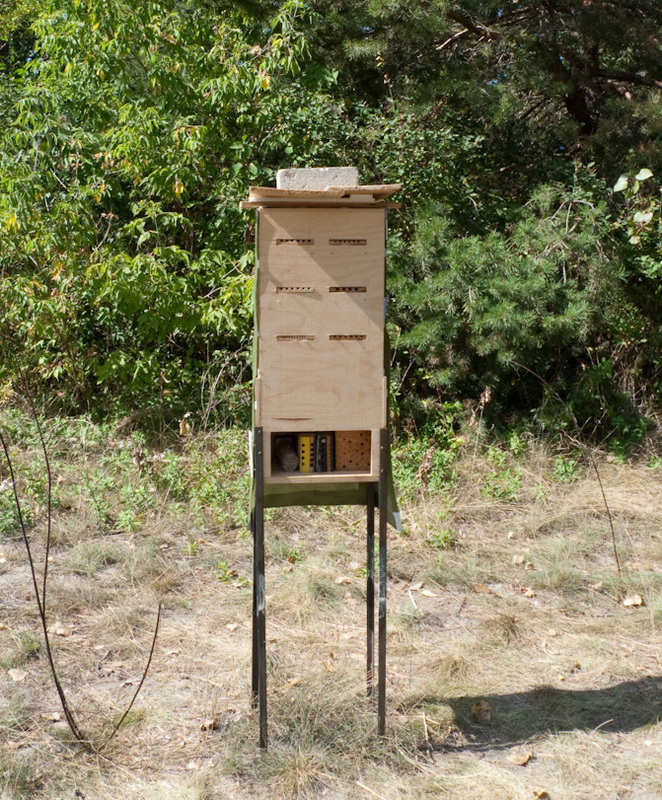 2009: Behold, the bee booth pre-prototype! 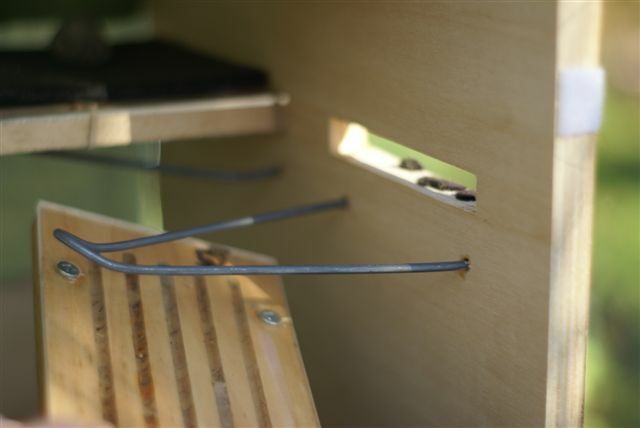 Bees and wasps co-exist in observable grooved blocks for your entertainment and education. 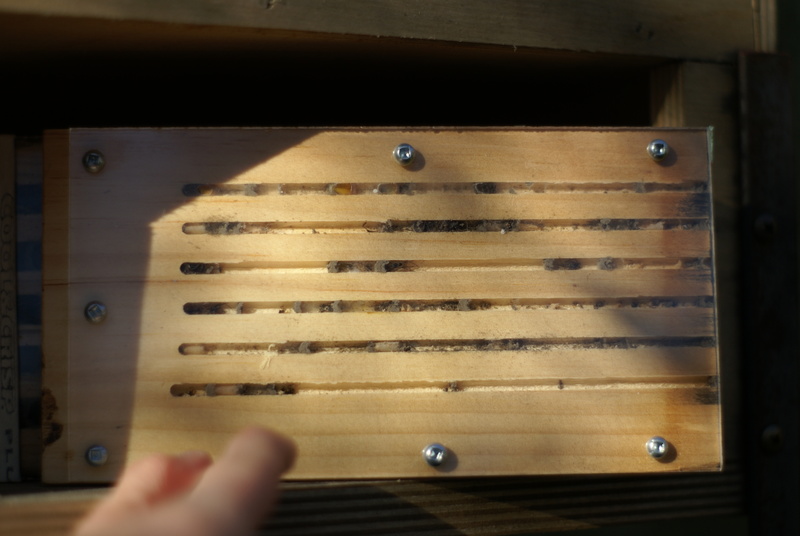 Observation ‘trap nest’ blocks are held both horizontally and vertically. It stands about 4 feet high once in the ground (naturally, no taller than me). Just shove it in the ground and you’re ready to go. It cost me about $125 to get a carpenter to build out of wood, with detachable steel legs (though this could be made out of plastic, I suppose). Facing East is best though South is probably good too, sometimes West as well. 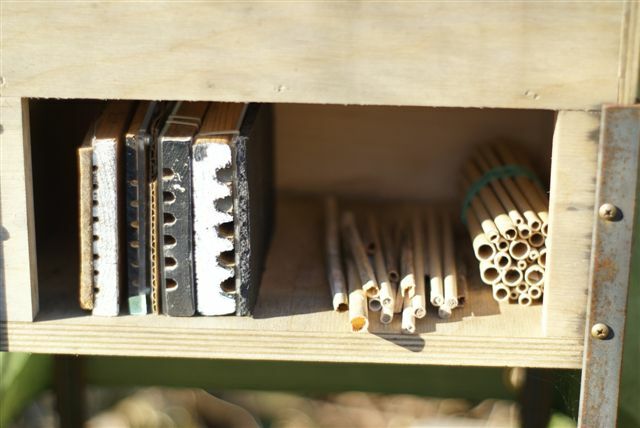 This storage area at the bottom of the booth (front side) is ideal for placing more observation nest blocks on their sides, and for adding drilled blocks of wood, straws, etc. The vertically-placed blocks made for much better viewing than as originally planned (which was horizontal, as in other photos here). 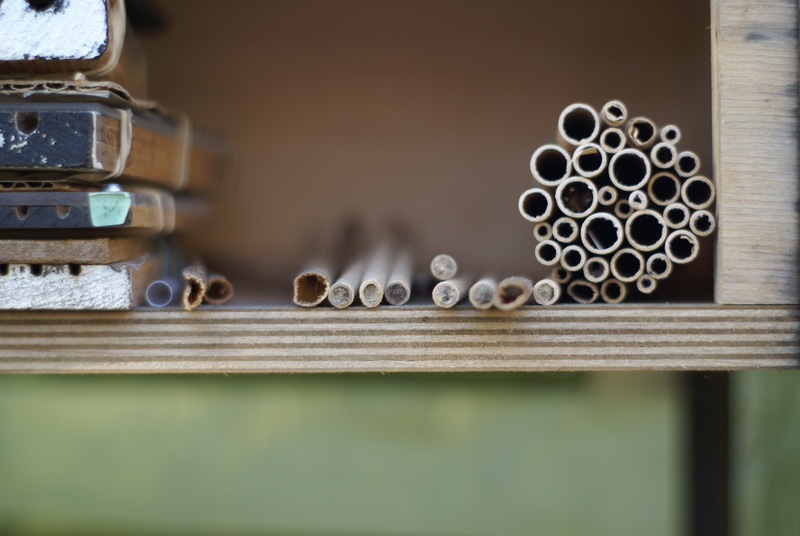 Some of our macro videos of nest-making bees and wasps show this off nicely. 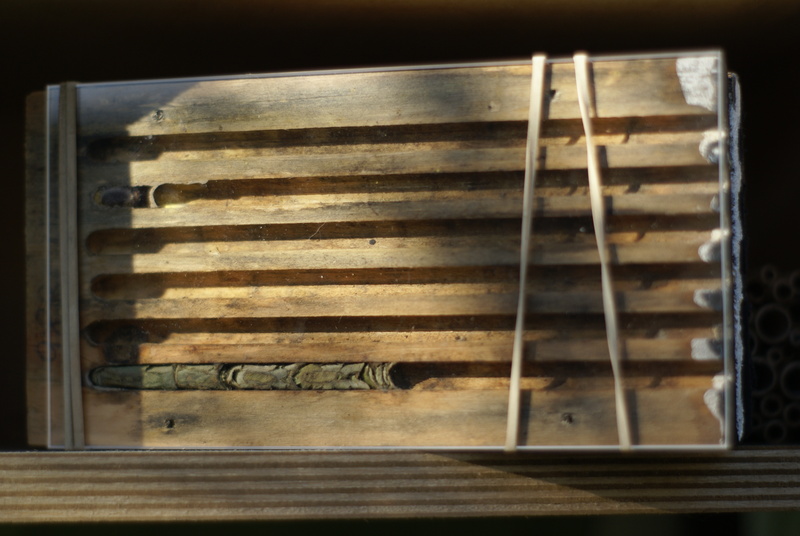 Observation ‘trap nest’ blocks held in place horizontally. Lid comes off. Drilled block ontop of the lid fits into storage area in front lower section (note several sizes of holes drilled for max. biodiversity!). Note blocks are usually covered for darkness. 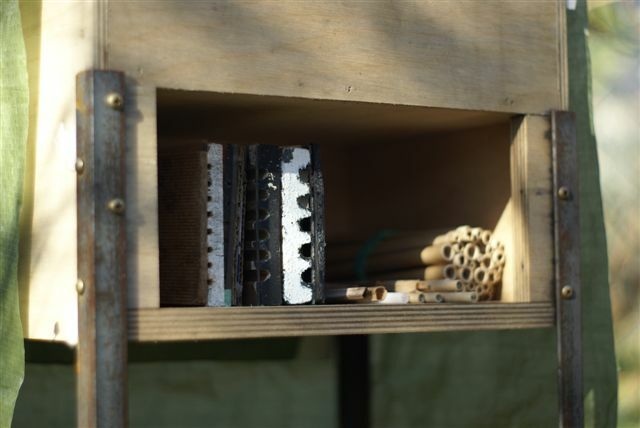 Handy lower space for audio equipment, drinks, sunblock and snacks (no, solitary bees and wasps don’t care about your snacks). Velcro attaches panels of tarp (which seem to come off after about 8 weeks). Sign attached to tarp wards off pesky youth bent on destroying things they shouldn’t. As does stealthy placement of the bee booth. 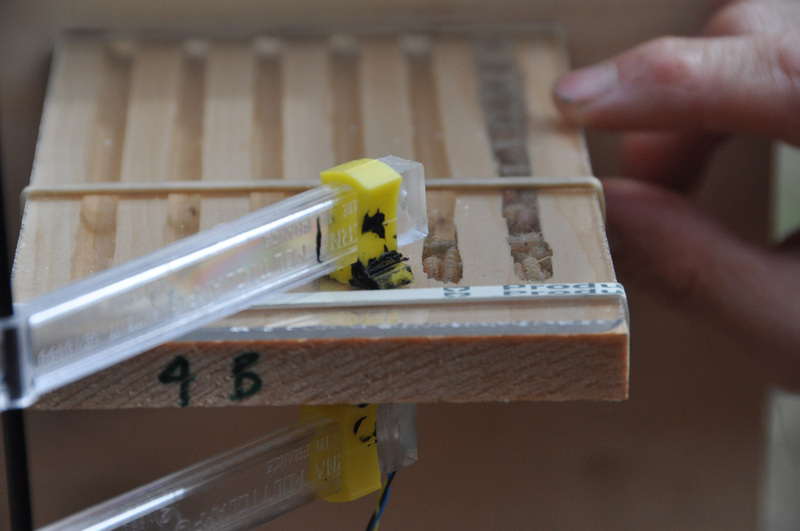 Small vibrational sensor clamped to block underside. 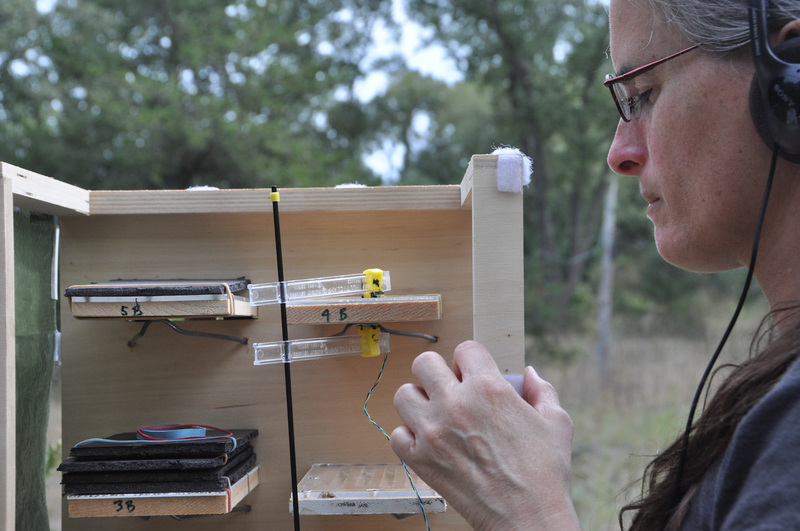 Very effective, but best embedded in wood block or wood chunk to keep out ambient noise (a cheap piezo electric disc works too, but not nearly as well). The sensor is connected to a custom-built preamp/amp circuit by Rob Cruickshank (thanks also to Knowles Acoustics for the BU series sensor. More info and pics of sensor here). 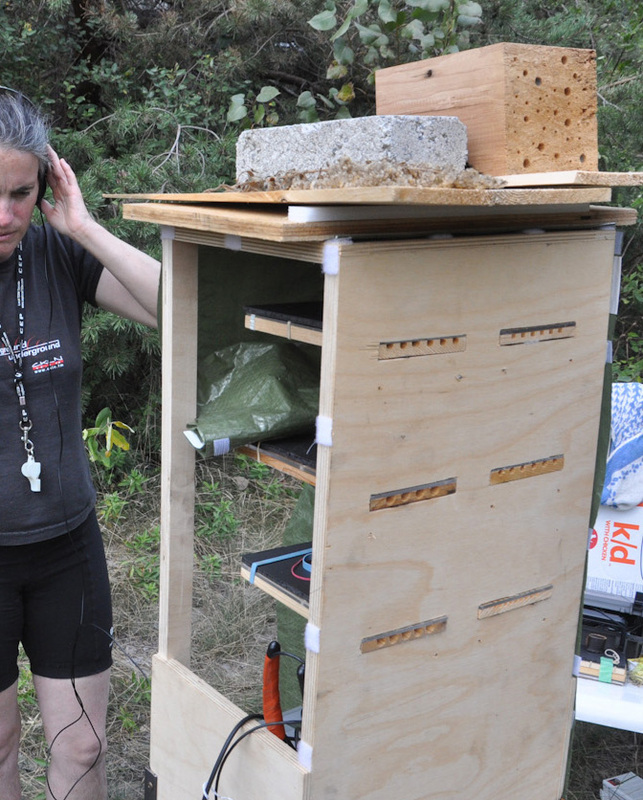 This ‘booth’ is a semi-open design concept for viewing *while* listening to nesting activities inside the blocks. 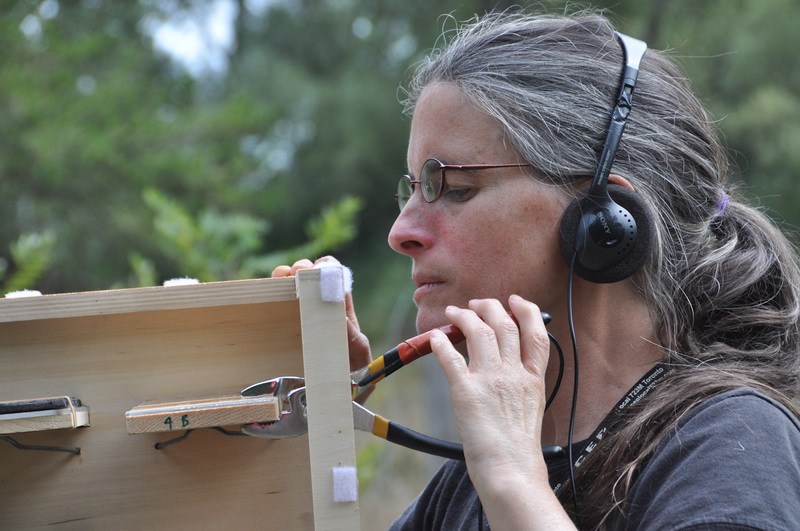 The Hastings triplet lens (used by geologists, about $50) and/or strong reading glasses ($15 – 20) are best for becoming completely immersed while using headphones. These smallish wasps paralyze and gather caterpillars; we can hear and watch them placing their prey. See videos with macro view and audio!! The ‘ampliplyers’ were a nice idea, but not quite hi-fi. Rob Cruickshank affixed a cheap piezo electric disc to the plyers and connected to a custom-built preamp/amp circuit (they worked nicely on other stuff, too!). 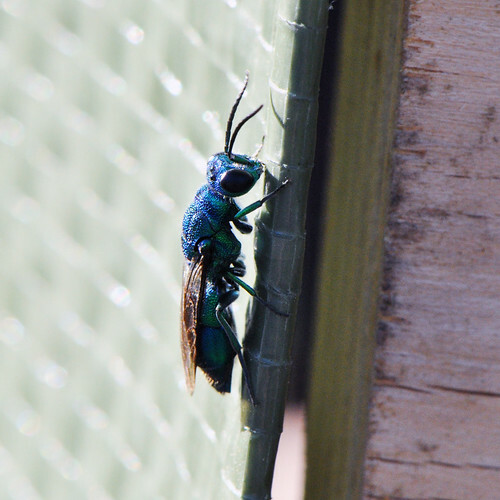 This Cuckoo Wasp was hoping to sneak into the nest of the wasp storing caterpillars (see above) Cuckoos abound in the insect world; see our cleptoparasite bee trading card #18. See related video. 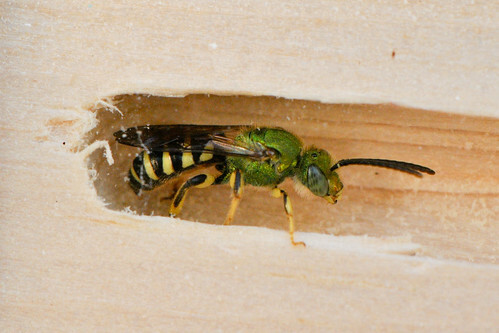 Male ground dwelling bees of the genus Agapostemon often hung out in the blocks at the end of Summer (see related video). See related video. 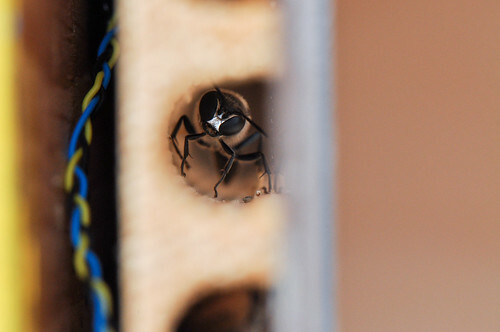 Large mud dauber wasps , Trypoxylon metatarsus made an intense Jimmy Hendrix-like sound while they sealed cells with mud and packed in stunned garden spiders for their young. See related video.